During day three, I spent most of the day running around Central Hall, after a brief stop in the North Hall to check out the eSports Experience. 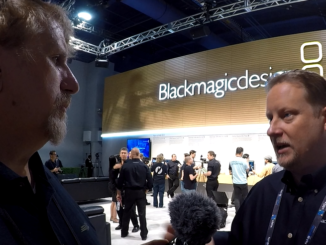 From there, I checked out Nikon’s Z6 camera (she’s a beaut), had a great chat with Josh Apter of Padcaster, drooled over Polar Pro’s Peter McKinnon edition Neutral Density Filters, and learned about how Digital Anarchy’s Transcriptive has improved over the last year. And then there was Teradex. A lot to talk about, so let’s get started! 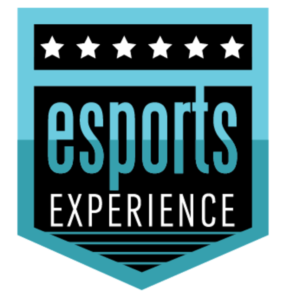 At the eSports Experience in the North Hall, I learned a lot about how the growing phenomenon that is eSports is going to rival professional ball sports such as the NFL, NBA, and others. There is some serious money and technology behind the professional eSports leagues and they are developing some impressive data management techniques, where not only the video of the game play is streamed, but also all the metadata on individual player stats, activites, and records. 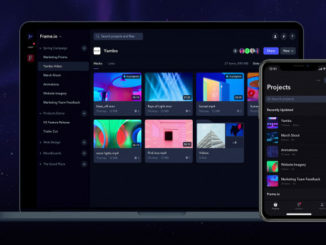 That data can then be disseminated to each player’s social media accounts, and give fans the opportunity to go in depth on each player’s game play. Add to that the serious production values that would make a technical director of Sunday Night Football feel at home, and you have an impressive new sports activity for the next generation of fans. I then made my way into the Central Hall, where I took a look at the Peter McKinnon Variable Neutral Density Filter by Polar Pro. McKinnon is a killer professional photographer/videographer and a rising star on YouTube. He’s been working with the guys at Polar Pro to create an impressive neutral density filter that comes in 2-5 and 6-9 stop variants, for sizes 67mm, 77mm and 82mm rings. But perhaps the niftiest feature is that Polar Pro has placed stop numbers on the ring itself, so you can see what stop you are on as you dial the neutral density. I rather like that. The filters are rather pricey, however, starting at around $250-300. But the build quality is definitely there, and it comes with a pretty cool lens cap which can protect your investment. Not far from there, I cruised by Padcaster and had a great chat with creator Josh Apter. Padcaster was the original cage for shooting video with the iPad, and it’s built like a tank. This year, Apter is launching two new products, including the Uni-Verse depth of field adapter and a new teleprompter kit for the iPad. 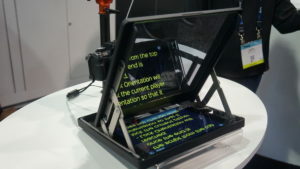 The Toucan teleprompter is about the size of a laptop and can be depl0yed to hang on the edge of your camera lens securely. But I really took a fancy to the UniVerse depth of field adapter, which comes with it’s own miniature Padcaster cage to house your smartphone, and has a PL mount, which can be adapted to a Sony eMount lens. Josh told me that there are plans to add an EF mount adapter as well, and maybe other models. The cost of the adapter, which includes the housing, the adapter, the rings, and a wooden grip is $450. Both are scheduled to ship this summer. 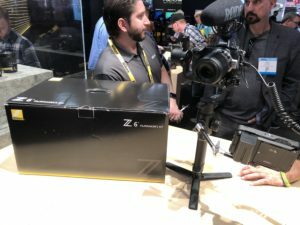 Then I swung by Nikon to take a look at the Nikon Z6, and their new Filmmaker Kit. The Kit comes with a Z6, a Nikkor kit lens, an Atomos Ninja V monitor/recorder, a three axis handheld gimbal, and all the needed accessories. Price is around $4,000 all in. And while that’s an impressive setup, at that price. Don’t try and go handheld with that rig, because it’s very ungainly and heavy. But the real news is that Nikon is adding 12 bit RAW to the Z6 this summer. Add to that support for CFExpress cards, and that is a very exciting update! From there, it was just a stone’s throw over to SmallHD and Teradex, where I got to take a look at both the Cine 7 field monitor, which has an amazing 1800 nit in brightness, and through the new camera control page, it can make adjustments to ARRI ALEXA Mini, Mini LF and AMIRA Cameras. 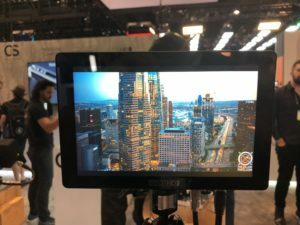 SmallHD also has plans to expand the RED and Sony cameras down the road. 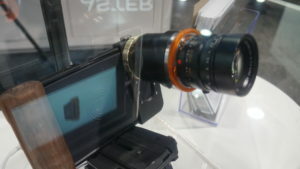 Meanwhile, Teradex had a wireless follow focus setup that could control both the aperture setting, and focus, and do it with either the Teradex RT wireless controller, or with an iPhone. That was pretty nifty, but what impressive is that the Teradex controller can pull focus from as far as 1.5km away, far beyond the wireless video signal can be sent. That closed out Day three, and with Day Four, I have already honed in on our best in show, and you can bet, it surprised even me. But you’ll have to wait until Monday to find out, because I’ve got to drive home!